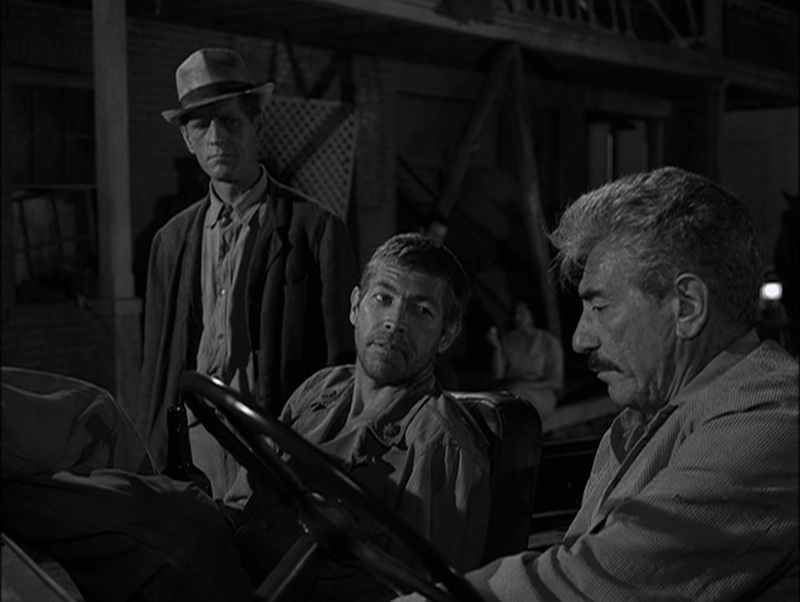 Strange little coincidences with this morning’s episode of The Twilight Zone, which Rod Serling scripted from a short story called Blind Alley by Malcolm Jameson. As regular readers may recall, I picked most of the new-to-me episodes for our viewing based on whether I knew the actors, and I always enjoy seeing the people who would later play villains on Batman in these roles. 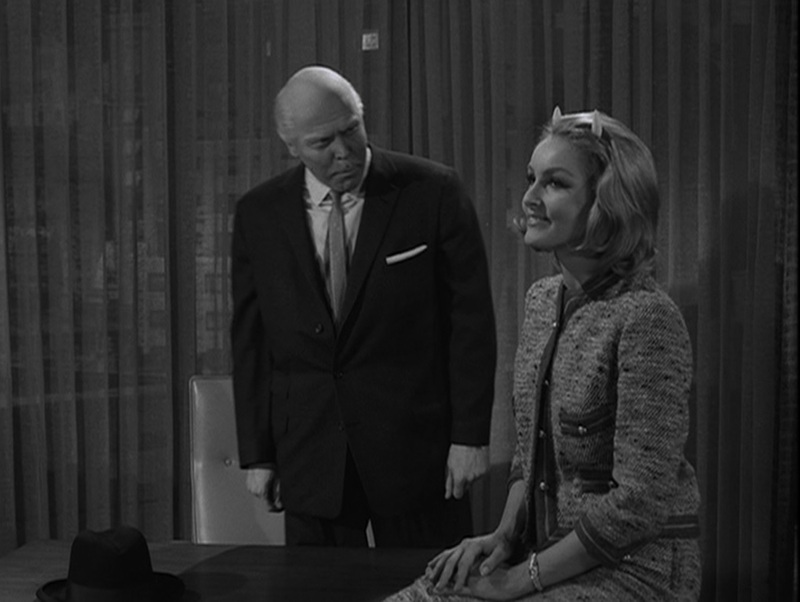 So the other day, we watched an episode with Burgess Meredith as the devil, and this morning, we watched Julie Newmar as the devil. I genuinely didn’t know when I picked these what the plots of these tales were! The other nice surprise was that title. As we started watching this show, I quickly became bored of Rod Serling’s use of the good old days trope of old men’s nostalgia for simpler times. I don’t think even Julie Newmar could save yet another one of these tales of men looking starry-eyed at old town squares. But that’s not what this is about at all, mercifully! Albert Salmi plays a downright sadistic robber baron who, having made his final, ultimate, screw-turning “deal,” has thirty million in the bank and is bored. The devil, here in the guise of a travel agent named Miss Devlin, offers him the chance to go back to 1910 and do it all again, only this time with all the memories of his past and about $1400 in his pocket. But memories are fragile, imperfect things. Once again, our son really didn’t enjoy this story. Salmi’s character is just too darn mean. Even when we pointed out that this is a story about a mean guy getting his comeuppance, he wouldn’t budge. But he did understand even the talkiest bits. The story opens with Salmi twisting the knife into a very old rival and letting him know his only way out is bankruptcy, and we paused it to clarify what went on, but he recapped it very well for us. 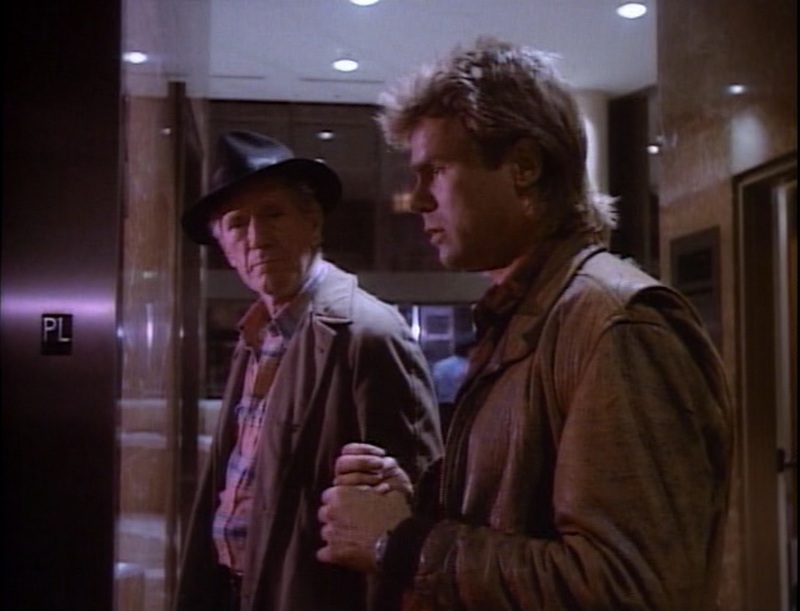 On the other hand, none of us spotted that the very old rival was played by gravel-voiced John Anderson, who we’ve seen twice as MacGyver’s grandfather Harry, so pobody’s nerfect. Actually, I’ll tell you who really wasn’t perfect, and that’s the makeup artist for this story. Sure, they had a chore making Salmi, Anderson, and Wright King all look fifty years older for the stuff set in the present so they could appear as their normal ages in 1910’s Cliffordville, but you’d have to have been watching with a bent antenna in a snowstorm on a very small TV set in 1963 to ignore Salmi’s unbelievably phony bald cap! Our son really enjoyed tonight’s episode, which introduces John Anderson in the recurring role of MacGyver’s grandfather Harry. It’s co-written by Stephen Kandel, and it’s the first of the episodes that we’ve watched that actually has some relation to the pre-credits “gambit.” In this season, each installment opens with a five or six minute “gambit,” usually a quick rescue with some improvisation. Terry Nation is credited with this gambit, in which MacGyver rescues a military general, who is gagged and handcuffed while wearing full dress uniform in the ocean-view room of a beach house right in sight of all the people playing volleyball. Not in the basement, in the main room. Good for Terry. I’m not sure I’d want my name credited on something that silly. 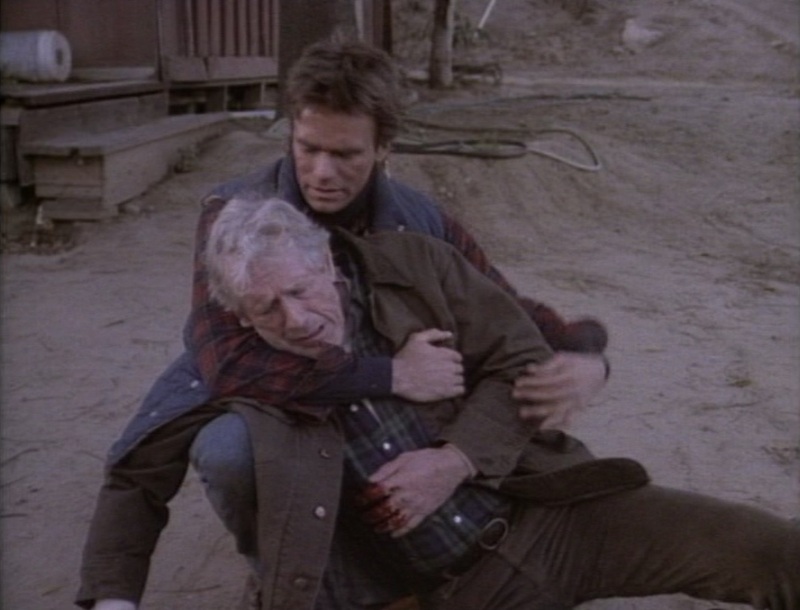 Anyway, the rescue leads into a demolition job, and the demolition job leads into MacGyver being stalked by a contract killer and seven very eighties teevee mercenaries, the ones who wear great big Ray-Bans and carry AK-47s and who were usually being covered with tar or bubble gum in The A-Team. The cat and mouse chase through the desert of Colorado leads them to a backlot ghost town for a final standoff. Our son gave this two thumbs up and said it was almost awesome. I learned something about the series this week. I remember that in 1993, CBS’s Murder She Wrote ruled the Sunday 8 pm time slot, and the other networks decided to bash heads and split the younger audience. ABC offered Lois & Clark: The New Adventures of Superman and NBC offered seaQuest DSV, a show executive-produced by Steven Spielberg. These two shows sort of ended up in the middle of the Nielsens every week. I remember it well because I was pretty active in Usenet’s Lois & Clark fandom then. If I ever knew this, I must have forgotten: this was actually history repeating itself. In 1985, ABC and NBC first split the potential younger audience against Murder, with MacGyver opposite Amazing Stories, which was also executive-produced by Steven Spielberg. Both shows barely made it into the top 50, just like L & C and seaBore would end up eight years later. Television executives back then just didn’t look beyond the previous season or two, did they?